The British Corner Shop Reward Points scheme is one of the most generous offered by any supermarket. Earn Reward Points every time you shop, and cash them in against future purchases. You earn 1 point for every £1 spent at British Corner Shop. The next time you shop with us you can cash the points in at checkout and reduce your shopping bill. You can save up your points for as long as you want. Many of our customers like to let them build up for Christmas. Do I need to register for the scheme? You need to register with British Corner Shop before you can start collecting Reward Points. You do not need to register for the Reward Point scheme separately. Points will automatically be credited to your account when you order. Registering is free and only takes a minute. It has many other benefits such as being able to view your order history and save your shopping basket. 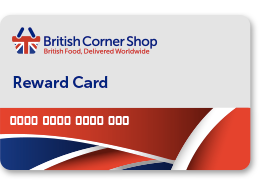 You must be logged into BritishCornerShop.co.uk when you order to earn Reward Points. The following table shows the cash value for various Reward Points balances. How can I cash in my Reward Points? You can choose to cash your Reward Points in at checkout. The cash value is automatically deducted from your sub-total. You can keep saving and build up your Reward Points throughout the year. Your Reward Points will be valid for twelve months. If your Reward Points have not been redeemed after twelve months, they will automatically be removed from your account. You must be logged in to your British Corner Shop account in order to redeem Reward Points at checkout. Does the scheme work if I use different currencies? Yes it does. Reward Points are nominally worth £0.02 each. If you are making your purchase in Euros or US Dollars, the website adjusts automatically and credits you with the correct number of points. Similarly when cashing points in, the exchange rate is taken into account. What are Extra Reward Points? In addition to the standard Reward Points earned on every purchase, you will frequently see products with extra Reward Points. Any product with this icon carries extra Reward Points above the standard rate. Hovering over this icon will tell you how many extra rewards are offered with the product, e.g. '50 Extra Reward Points'. When added to the shopping basket, your total of extra Reward Points is displayed. 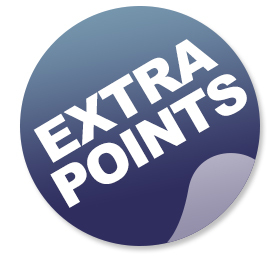 You earn the extra rewards for each item added, so if a product carries 50 extra points and you buy 3 of them, you will receive 150 extra Reward Points. Extra Reward Points are added to your overall Reward Points balance, and count for exactly the same as standard ones. How can I check my current Reward Points balance? To check your current balance, log in and click on 'My Account', at the top right of the screen. Then select Reward Points from the left hand menu. Can I redeem against delivery costs? No, Reward Points are earned for every pound spent on shopping only, shipping charges are excluded. On any given purchase the maximum cash value of reward points you can redeem is the total value of your order minus the delivery charge, and rounded to the nearest point. Rack up reward points by contributing product reviews to the British Corner Shop website. Earn 15 points, which are worth 30 pence, for each review you write. Learn more about our product reviews scheme.